Mens Right Handed Complete Golf Set. This Premium Quality set has everything you need to hit the course. Set features 460cc Titanium Driver, 3 Wood, 5 Wood, and Hybrid. (This technologically advanced set offers great control and distance... These clubs all have Regular Flex Graphite shafts for added distance) Oversized Irons 5,6,7,8,9,PW,SW and a Face Balanced Putter (all with True Temper Regular Flex Steel shafts for added accuracy and touch). This is one amazing playing and looking set. Tbook.com crawls the web to find the best prices and availability on Golf Equipment and related Sporting Goods products like Mens Golf Set Clubs and Bag Complete Driver, 3 & 5 Fairway Woods, Hybrid, Irons, Putter Sand Wedge & Deluxe.... For this page, related items include products we find that match the following keywords: "Golf GOLF" at our vendor partner Walmart. 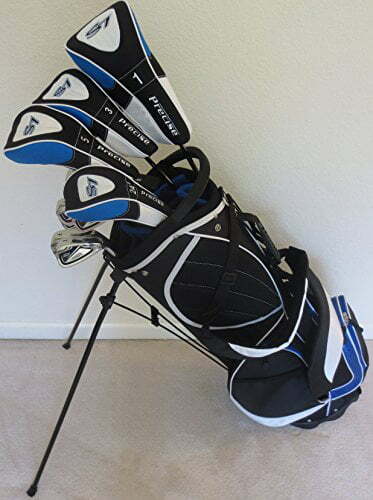 Mens Golf Set Clubs and Bag Complete Driver, 3 & 5 Fairway Woods, Hybrid, Irons, Putter Sand Wedge & Deluxe... is one of 202 Golf Equipment and related products listed in the Sporting Goods section of Tbook.com If you have any questions on this product, please give us a call at 734-971-1210 during the hours of 9am - 5pm EST for assistance. Thank you for shopping at Tbook.com, the Internet Department Store!